This is a genuine Victorian Carpet Ball or Carpet Bowl as they were known in Scotland. 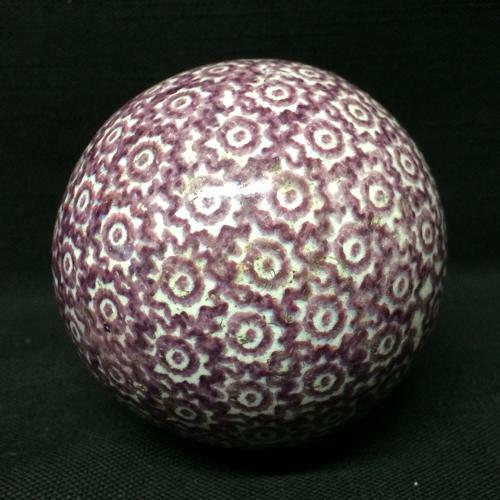 The medium sized sponge painted ceramic ball measures approx. 3” in diameter, heavy duty solid glazed and decorated ironstone. Rare uncommon color. Carpet Bowling was an indoor game popular in Scotland and later England. It was played indoors as a parlor game using heavy ceramic balls known in Scotland as ‘Piggies’. The game was extremely popular between 1860 and 1880 and almost every home had a set of ‘Piggies’. It was a popular pastime and was encouraged by the churches to “prevent young men from partaking in alcohol and mischief” and local schoolrooms were often permitted to be used as bowling halls. Similar to Bocce , the goal was to get your ball closest to a smaller plain "Jack" while knocking your opponents' ball out of the way. Half the game balls had a striped or plaid pattern, the other half had a sponged design. The sponged balls are more rare than the others. Ceramic balls like these were used until about 1895 when the Scottish Bowling Association decided on Lignum wood or a plastic substance called ‘Lawrite composition’ and a uniform size was set at no more than 12 inches circumference. Carpet balls are back in vogue for home decorating, displayed in a bowl or simply sitting on a shelf. Because of their popularlity, there are many reproduction carpet balls. So be careful when shopping around. Look for the marks of character in the ceramic glaze, minor chipping and wear from use. If they look too perfect and aren't very heavy - beware! The carpet balls were made around 1860 in Scotland or possibly Dawsons Low Ford Pottery in Sunderland , which also produced sponge and transfer printed carpets balls during the same period. There is no maker's mark. The condition is great. A glorious example of the finest in English folk art to add to any collection of early sporting goods or early English ceramics.